This research documents a 150-year record pertaining to the duration of closed navigation for Bayfield harbor. Data were gathered recording the opening and closing of navigation in Bayfield, Wisconsin from 1857–2007. Data were primarily collected from the Madeline Island Ferry Line and microfilmed copies of the Bayfield County Press. Analysis of the data indicates that the duration of ice cover on Lake Superior at Bayfield, Wisconsin has decreased over the past 150 years at the rate of approximately 3 days/decade or 45 days over the course of the study. During the past 150 years, the date that the last boat is able to navigate in the Bayfield harbor indicates the onset of ice cover. This date has occurred an average of 1.6 days later every decade. Conversely, the date that the first boat is able to navigate in Bayfield harbor marking the break up of ice cover has come to an average of 1.7 days earlier every decade. Although this represents the overall trend for the past century and a half, the most dramatic changes have occurred since 1975. During this period the ice season has begun an average of 11.7 days later and ended 3.0 days earlier every decade. Bayfield's ice season was compared to the lake's annual maximum ice concentration (AMIC) as compiled in a study by [Assel, R.A., Cronk, K., and Norton, D. 2003. 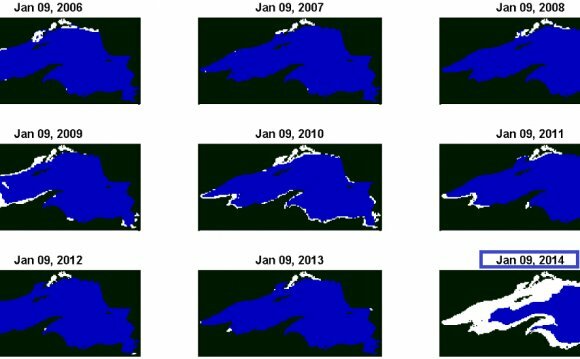 Recent trends in Laurentian Great Lakes ice cover, Climatic Change 57: 185–204, 2003.] The fraction of the potential closed navigation season that the Bayfield harbor is ice covered decreased at a rate of 0.77% a year while the AMIC decreased at a rate of 0.39%/year during the period from 1964–2001. In general, the decline in the ice cover at Bayfield mirrors the pattern shown by the AMIC, suggesting that Bayfield's ice season could be used as a nonspecific indicator of overall lake trends.